Sale: Triton VIII, Lot: 1088. Closing Date: Jan 10, 2005. AV Aureus (8.02 gm, 6h). Uncertain (Eastern?) mint. The Philippines is believed to have been linked to almost all part of the globe because of its strategic location. History of piracy, sunken treasures, and lost troves of gold are ordinary tales that can be heard from the daily lives of the Filipinos. A couple of months ago, ABS-CBN together with the cooperation of the Ayala Museum and the Central Bank Museum of the Philippines even featured “Ang Gintong Pamana” a documentary report of how a lost treasure of gold ornaments and artifacts were recovered by a common peasant. A treasure composed of magnificent, intricate, and fine works of ceremonial accessories fit for a King. Even in the world of numismatic, discoveries of local numismatists of rarities such as of the 1901-San Francisco Mint Barber Quarter, the platinum 2-pesos Isabel, and other exceptional finds are considered phenomenal which could have added to the rich description of the archipelago as the “Pearl of the East”. Despite the country’s history of wars, plunders, conflicts, and colonization, it has remained as one of the top destination for Treasure Hunters and Fortune Seekers. Recently, a rare Ancient Roman coin surfaced in the Philippines. This time, it is the rare aureus of Augustus believed to be made during Augustus conquest of Greece. Luckily, this site acquired the scanned obverse of the actual coin for this article. Since only a very few number of local numismatist are considered expert in this field, this site however has no guarantee of determining its authenticity except to present the actual image of the coin in a standard acceptable of scrutiny. Aureus, is name of the gold coin minted by the Roman at the height of the empire’s prosperous years and conquest. The portrait of Augustus on this aureus continues to excite comment, and its fine artistry has led scholars to conclude that it was produced in the East. Of the five portrait dies illustrated for these aurei in Bahrtfeldt and Calicó, the one used to strike this aureus is arguably the most engaging: we see sharp, clearly modeled features, suggesting the engraver came close to the mark. The heifer is generally believed to represent a group of bronze statues cast in the fifth century B.C. After his victory at Actium, Augustus requisitioned from Athens four massive statues of cattle that had been created by the sculptor Myron. They were monumental prizes of great antiquity, but the Greeks could do little to object, and Augustus used them to adorn an altar in his Temple of Apollo on the Palatine. Interestingly, a cow that must also represent these sculptures appears on coins of Vespasian struck in 74 and 76, and since that emperor used Myrons cows to decorate his new Temple of Pax, completed in 74, we find a good explanation for the recycling of this attractive Augustan type. In terms of art, there are few Roman coins that can compare with this famous issue, on which the portrait of Augustus is the equal of any masterpiece of the Hellenistic Age. But its beauty is not at the expense of accuracy, for if we rely upon marble busts and the early coinage of Augustus, the image is true: a compact mouth and chin, a long nose, high cheeks and a broad forehead. The portrait has much in common with the best-style Aegypto Capta issues struck for Augustus in the East c. 28-27 B.C. Furthermore, both this issue of aurei and the Aegypto Capta issues come in two distinct styles – one of especially good art, with a capricorn beneath the bust, and another of more pedestrian style without the capricorn. The reverse type is of historical interest, for it reflects Augustus’ well-attested interest in Greek antiquities. Like most of the senatorial aristocracy of Rome, Augustus had a keen interest in Greek culture, and after Actium he requisitioned from Athens four massive statues of cattle created by the sculptor Myron in the fifth century B.C. According to Sextus Propertius, Augustus used the statues to decorate an altar within his Temple of Apollo on the Palatine: "...round the altar, stood four of Myron’s cattle, carved statues of oxen, true to life." (The Love Elegies, Book II:31). 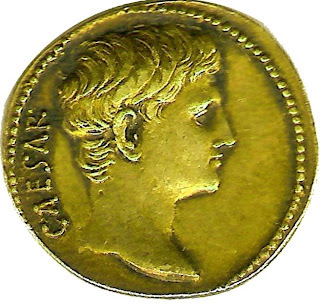 Hill reports that Augustus dedicated the temple in 28 B.C., and since the cow on this aureus is of such individual character, and there seems no other explanation for the type, we should not doubt this coin depicts one of Myron’s cows. 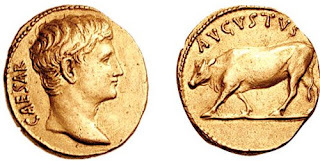 Further, a cow of the same posture appears on coins of Vespasian struck in 74 and 76; since Vespasian used Myron’s cows to decorate his new Temple of Pax, completed in 74, we find a good explanation for his recycling of the Augustan type. They remained there for a great length of time, for they are described by Procopius as being at that location in the sixth century. Precisely when and where this aureus was struck is still a matter of debate, for the inscriptions and types are of no help in that respect. Authorities seem to agree it was produced at a mint in the East, perhaps at Pergamum or Ephesus. However, views on the date diverge greatly: Sutherland describes it in general terms as being struck after 27 B.C., Mattingly suggests 27-20 B.C., Kent places it in about 25 B.C, Hill in 20 B.C., and Calicó later still, between 19 and 15 B.C.